The energy has been raw and intense these last two weeks due to the Mercury Retrograde which started on March 22nd and ends on April 15th. Retrograde period is generally not a good idea to start anything new. For most of us, it is a time lay low and keep your thoughts to yourself. Communication and electrical issues are common so buying new things or trying to get people to respond to you will be a painful experience. When Mercury is in Retrograde, the energy is conducive for planning and adopting a “hermit” approach. Anything else will result in a frustrating experience as things tend to go wrong. Plan now and be ready to take action after April 15th because things will move rather quickly by then. So you want to be prepared. Many of us feel very nervous, extremely hot in our bodies, dehydrated and issues may crop up for you to deal with. This is the universe asking you to deal with health issues head on before it turns into a big problem. I had a niggly tooth issue and I have been trying not to go to the dentist. Then i woke up the other day with pounding head and tooth. I just knew that if I didn’t go see the dentist, there would be an expensive and not to mention painful outcome. Luckily they spotted an early abscess which is now being controlled by antibiotics. So if you have something that has been bothering you, please don’t self medicate, this is cropping up for a reason. Go see your doctor. We as humans try to sweep things under the carpet but the Universe knows best and will show us the signs to take care of ourselves. The reason for the physical symptoms I described above is that there is a huge amount of energy and activity astrologically speaking. 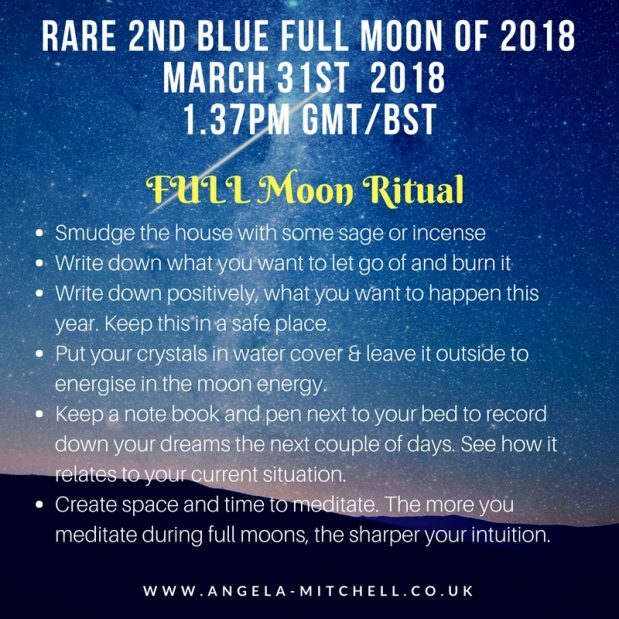 This is intensified by the fact that we have a full moon tomorrow and its the 2nd BLUE FULL MOON of 2018. Why is this special? The last time we had two Blue Moons in a year was 1999 and it won’t happen again until 2037! 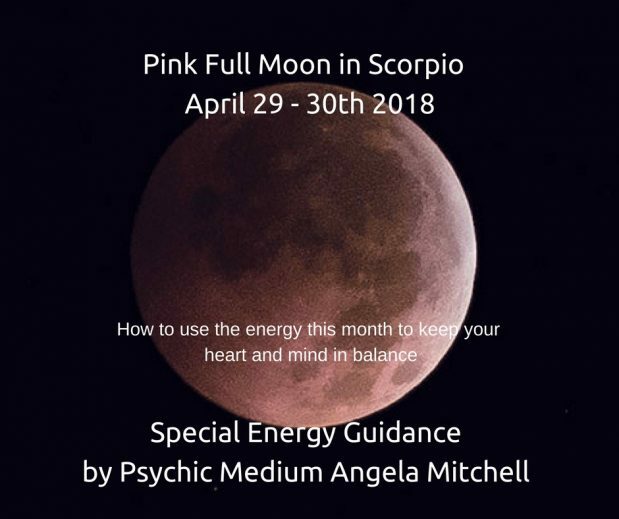 The energy has been building up since Jan 31st Full Moon. 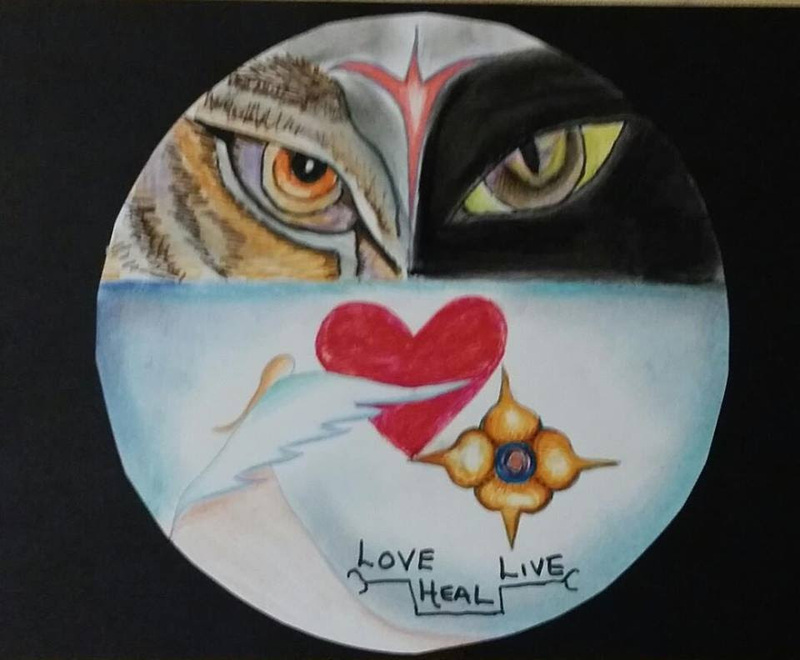 The energy is intense and some raw feelings have been surfacing for us to deal with, mostly bringing up emotions for us to deal with, leaving us feeling frustrated, exposed and vulnerable. March has also felt very sluggish and dense. January to February felt very fast and we were almost breathless trying to catch up. We are being slowed down for a reason. Time to take a breath, look after our health and review our journey. March being the 3rd month of the year, represents balance – MIND, BODY and SOUL. If you have been neglecting any of the three then you will be slowed down to review your life path. We need a harmony within our body, mind, and soul to be happy. March’s full moon is in Libra which again, is about BALANCE and justice. 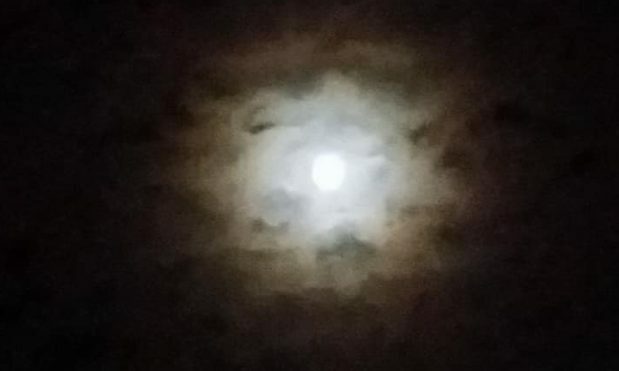 If you have been feeling unsure about yourself lately then this full moon will help re-align you to your roots. Remember, the Full Moon is here to help you let go of what no longer serves you to make space for new and better things. 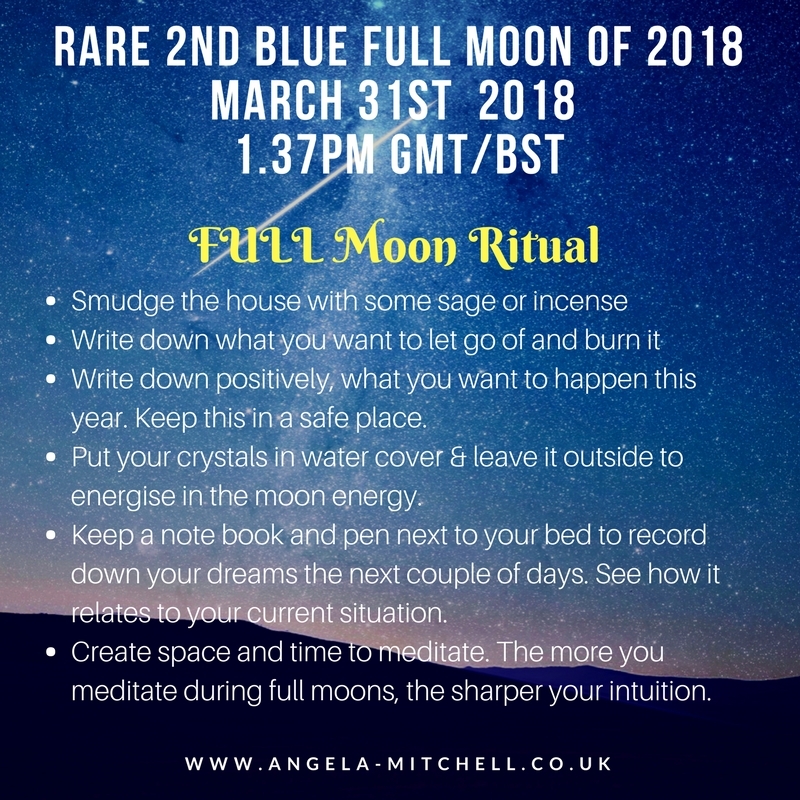 Don’t forget to take advantage of this amazing energy day by doing my Full Moon Ritual before April 1st 2018. The New Moon and Solar Eclipse on February 15, 2018 fall the day after St Valentine’s Day, a universal celebration of love and relationships. As it falls on the Aquarius sign, which has a strong accent on relationships, intellect and sense of community, we are being asked to view our emotions and how people influence us. Some of us shy away from being “involved” and like to stand by the sidelines, hoping someone else will take charge and not be noticed. You may this may start to change as there will be a need to come out from the shadows and seek companionship by active participation. So is there a cause or an interest that you have been wanting to be a part of but have been scared? This is the perfect opportunity to put yourself forward because you stand to gain so much by doing so. The Solar Eclipse asks us to look into our “darkness” to acknowledge the things we keep burying inside of us. They influence us in so many ways that we subconsciously know but refuse to acknowledge. Be true to yourself and face the darkness within to shine the light from within. A Solar Eclipse is powerful because the Moon eclipses the Sun but this month it will be a partial eclipse. 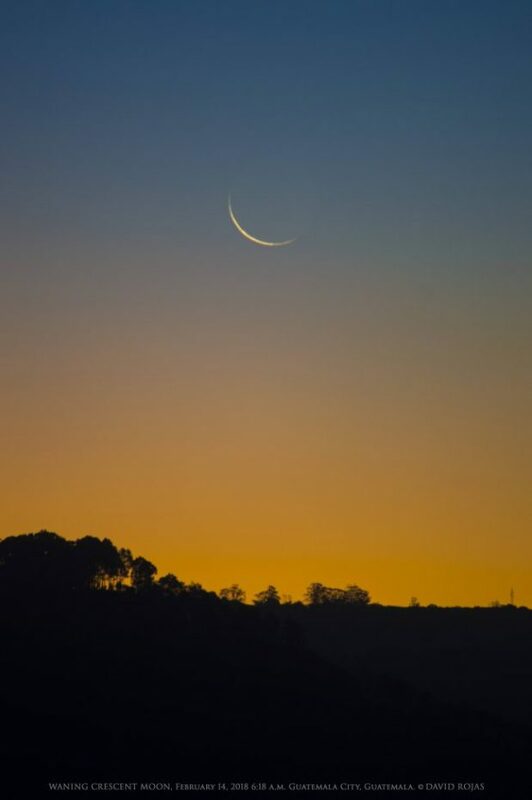 As it falls on the New Moon which is the beginning of a new cycle, so this will bring about deep discussions about relationships for those who are in partnerships. For those who are single, this will be a time where you will start thinking about manifesting your soul mate and release any set ideas about marriage and children. There is rising female energy associated with this new cycle and it feels very empowering and life changing. Use this time to make space for your loved ones, have open honest discussions to move forward and practise rituals to honour your own spirit. Physical Symptoms : fatigue, vivid dreams, headaches, stomach issues and some may feel excessive thirst. Drink some flower base tea and ginger seeped in hot water. 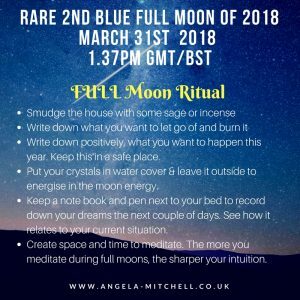 Do your Moon Ritual between tonight and Friday night. Here are instructions on how to sage, write your wishlist and cleanse your crystals. Meditate – You need 5 mins, a comfy chair or space, light some nice incense and ear phones. Leave a note book and pen next to you. Put this beautiful meditation music on your phone/ipad. Breathe in and out slowly. Let your thoughts drift away and just relax into the music. You can put the video on loop so you can listen to it longer than 5mins. Incredibly relaxing and calming. Write down anything that pops into your mind and see how it relates to your life. Pay attention to your dreams as this is the only time our minds are not in control. Write down your dreams in a dream book with date and time of waking. Track the coincidences and messages in your day and compare it to your dreams. You may find that there will be a message or symbol that relates to what is happening around you. Often emotions are also expressed in dreams. For example if you are trying to suppress your emotion or anxiety in your day then your dream may give you a clue as to how you are really feeling.